If your family craves a genuinely French experience and more authentic souvenirs than you would typically find, check out the historic flea markets of Paris, France. 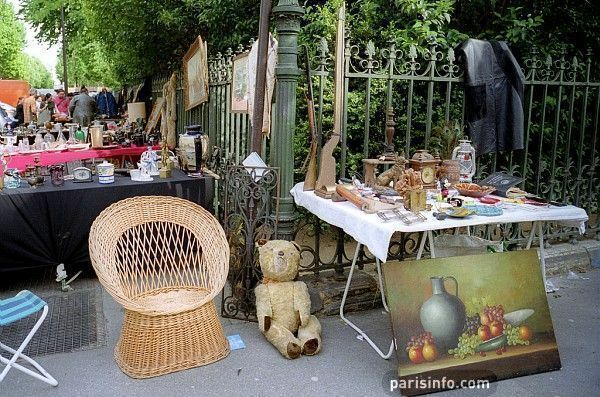 Flea markets or les marchÃ©s aux puces are a French institution dating back to the late 1800’s when Napoleon III’s urban reformist, the Baron Haussmann, forced bric-a-brac merchants to set up shop on the outskirts of Paris. 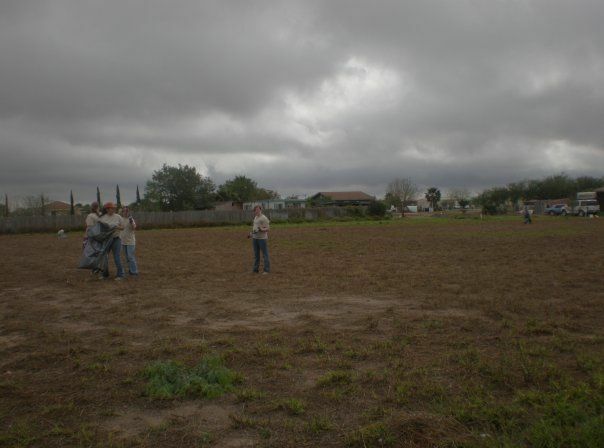 Ironically, the Baron’s attempt to banish poor merchants only made them more successful as they could now function outside of the city’s tax zone. The rows of colorful stalls that soon crowded the city gates every weekend became a hit with both travelers entering and exiting the city, as well as affluent Parisians who would frequent the spectacle on their Sunday promenades. More than a century later, Parisians still flock to these fringe bazaars in search of antiques, art, clothing and much more. 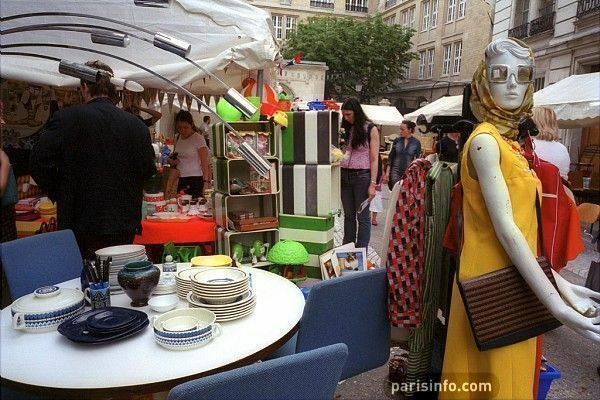 Every Saturday and Sunday morning of the year, merchants from near and far fill the 350 stalls that line Avenues Marc Sangnier and Georges Lafanestre for what many say is the most inspired flea market in Paris. Vendors here showcase an array of original artwork and recent antiques that include jewelry, stemware, fabrics and more. 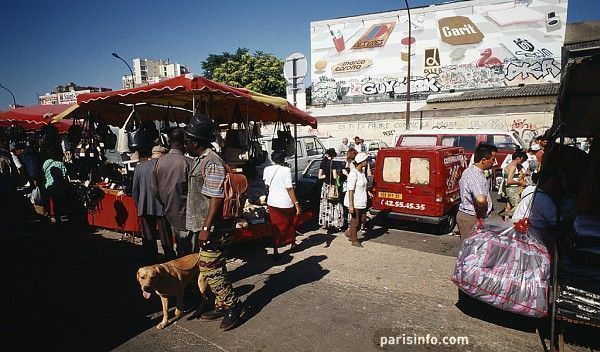 MarchÃ© aux Puces de la Porte de Vanves is located in the 14th arrondissement and is open from 6:3 am until 4:30pm. To get there, take the 13 line to metro stop Porte de Vanves. Unbeknownst to many tourists, MarchÃ© d’Aligre has been operating in the super local 12th arrondissement since 1777. In addition to an eclectic collection of flea-market stalls, this open-air marchÃ© also offers a variety of fresh produce as well as artisanal wines, breads, and cheeses. After a day of shopping, take some time to experience the neighborhood’s North African charm by enjoying some couscous merguez and mint tea from any one the many Moroccan cafes. The MarchÃ© d’Aligre is open from 8:00 am to 1:00 pm and 4:00 pm to 7:30 pm from Tuesday through Saturday and 8am to 1pm on Sundays. The market is located off of the Lerdu-Rollin metro stop on the 8 line. At the very northern tip of Paris, in the neighborhood of Saint-Ouen, sits les Puces de Saint-Ouen – the largest flea market in the world! Les Puces is comprised of 16 niche markets that collectively attract everyone from world famous designers and artists right on down to everyday collectors and bargain hunters. For fashionistas who look to the chic history of Paris for inspiration, the Malik Market boasts 100 stalls of vintage clothing. In addition to everyday pre-worn clothing, Malik boasts a trove of haute couture treasures that are both timeless and affordable. Trying to snag something that screams Art Nouveau? Than visit Serpette Market – a transformed Citroen garage that now houses a pricey collection of furniture and decor from the Belle Ã‰poque. If you are shopping on a limited budget and don’t want to leave Les Puces empty-handed, then poke around the Vernaison Market. Somewhere within this bric-a-brac maze of posters, toys, and other antique collectables, you are sure to discover a fun souvenir that’s both cheaper and more original than anything you could find at a postcard shop in the Latin Quarter. Les Puces de Saint-Ouen are open on Saturdays from 9am until 6pm, on Sundays from 10am until 6pm and on Mondays from 11am until 3pm. To get there, take the 4 line to the Porte de Clingnancort metro stop and simply follow the crowds. For more information about Les Puces de Saint-Ouen including a map as well as a complete listing of markets, please visit Les Puces de Saint-Ouen online. If you’re heading out to conquer the flea markets, you’ll find these tips — born of much experience and frequent heartache over missing a great find — to be priceless. • Be sure to get there early! By early afternoon, the flea markets will have already been picked over by serious shoppers. • If you are looking to purchase anything that will not fit into your suitcase, contact an international transport service before you even go to the flea market. Hedley’s Transport, who has an office at les Puces de Saint-Ouen, will let you mark the items you have purchased with a sticker that indicates same-day pick up. • Bring cash. While most stalls do accept credit cards, using cash euros for smaller purchases is always easier and much appreciated by the dealers. • Wear comfortable shoes. These flea markets are big and require a lot of walking. Don’t let a pair of aching feet prevent you from finding a piece of Parisian treasure. • Bargaining is half the fun! Prices at these flea markets are negotiable so don’t be afraid to bargain with vendors. • Make sure the kids have some allowance to play with too; you can never start shoppping too early. Next Article Next Article Madrid is Awesome!